This page contains the information required to help repair and diagnose the fault codes being shown on the boiler display. The following information, will take you through the fault finding sequence or steps, for rectifying a Vaillant Ecotec boiler with this fault code. Suggested solutions will be detailed further down the page. The F.52 and F.53 fault codes indicates a fault with the mass flow sensor, that is located just behind the gas valve connecting to the fan on Vaillant Ecotec boilers. There may be several causes of this fault, either mechanical or electrical. The meaning of F.52 is that there is a connection fault of the sensor. The meaning of F.53 is that the flow sensor function is faulty, or the filter cap is wet, filter cap is blocked or gas flow pressure too low. As show in Image 1, you can see the mass flow sensor as shown by item 1 on the diagram. Item 2 is the connecting tube. Item 3 is the nut connecting to the gas valve. 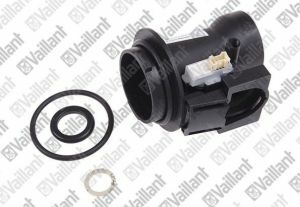 Shown in image 2 is the actual replacement vaillant part. In order to repair this fault, you may need to check first the sensor is connected correctly. Simply remove it and plug it back in. This will most likely address and F52 fault code. In order to fix and F53 fault code you may have to electrically test the functioning of the sensor and it’s output values, using readings available from Vaillant technical. An engineer can check it electrically, and if necessary replace this part. If the part is functioning properly, there may be a possibility that either the gas supply is too low or the PCB is at fault. Gas supply pressure can be checked by a gas heating engineer using gas testing equipment. Gas appliance repairs should be carried out by Gas Safe Register listed professionals. Disclaimer: Information on this website is provided for informational purpose therefore we cannot accept liability for subsequent problems. All repair tasks should be carried out by qualified trades people. We may also receive commission payments when you are taken to external websites and complete purchases from third party sellers, once you leave our site, we cannot be held liable for your purchases.